She Threw Herself Under a Horse For Women’s Suffrage … Or Did She? They’re common around elections, and the story usually goes like this: militant suffragist Emily Davison, hoping to draw attention to the cause, committed suicide at a 1913 horse race by throwing herself under the hooves of a horse. Or did she? It turns out the truth about Davison, and her motives, are more complicated. Davison was one of England’s more devoted suffragists, quitting her job as a teacher to agitate for women’s rights full-time. She joined the Women’s Social and Political Union, a group founded by the inimitable and fearless Emmeline Pankhurst and comprised of women “impatient with the middle class, respectable, gradualist tactics” of their counterparts in the British suffrage movement. Davison quickly became a fearless campaigner, embracing increasingly more militant tactics that included arson (setting fire to mailboxes), rock-throwing, assault, and even hiding in a cupboard in the House of Commons so she could list it as her residence on the census. Her extreme civil disobedience was rewarded with multiple stays in prison, during which she was force-fed and hosed down with cold water. Her behavior gained her little favor with her compatriots in the movement, many of whom tried to distance themselves from her tactics. In 1912, while serving time for arson, she even attempted suicide. “The idea in my mind was ‘one big tragedy’ may save many others,” she is reported to have said before jumping 30 feet from a prison window. Though biographers believe the move was in response to the threat of being force fed, Davison’s contemporaries saw an activist prepared to commit suicide for the cause. This did, in fact, seem to be Davison's motive on June 4, 1913, when she attended the Epsom Derby. 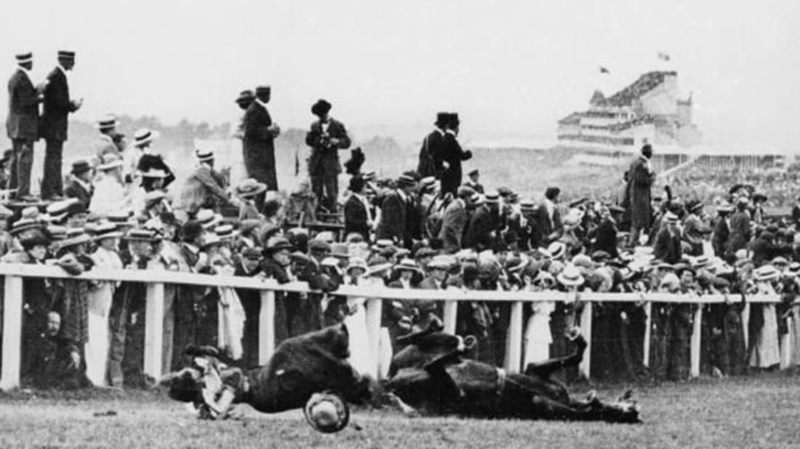 During the race, she jumped onto the track and ran toward Anmer, a horse owned by King George V. Horrified spectators looked on as she was dragged beneath the horse’s hooves. Though initial reports claimed that she had survived, she died of her wounds four days later. Additional References: Literature of the Women’s Suffrage Campaign in England; The Life and Death of Emily Wilding Davison: A Biographical Detective Story.